Here some general technical info can be found. More specific product info can be found under “Products”. — The Unic gear shift system is optimised in order to give ultra quick and safe gearshifts which is extra important in Rallycross Supercar in where the starts and accelerations from low speed is a key for sucsess. This gives also the bonus effect that the dog wear is close to nothing. — The Unic LHS Limited Slip Differentials are used in Front, Rear and Center. This diff has a smooth function and the preload can be adjusted from outside. The design of diffs, driveshafts and joints allows a very long suspension travel. — The 100 mm distance between the main axles in the gearbox make the UNIC gear box very strong. The rest of the drive train is designed to keep up with this strength without any weak point. 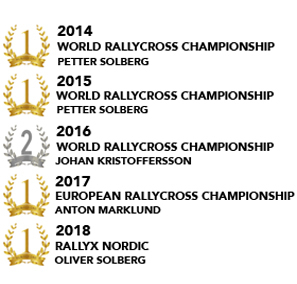 The reliability are proved from a very few problem occasions in all SuperCar races in the World Championship 2014 – 2016, the European Championship 2013 – 2016, the Nordic Championship 2015 – 2016 and we are proud over the fact there have not been any transmission failure in any race during 2016 which have stopped or slowed down a SuperCar equipped with the Unic transmission. Quick service and repair between heats is one of the most important properties of a winning SuperCar concept. The Longitudinal layout is outstanding concerning this. The separate front, center and rear differential unit are easy and quick to access, adjust or replace. The Unic gearbox is designed to be very easy to dismount with few screws, an input spline shaft only 25 mm long. The prop shafts with spline to the gearbox means just 2 bolts have to be removed. There are 3 pcs inspection plugs in the gearbox casing which can be removed for dog inspections. When the gearbox is dismounted, the bellhousing can easily be removed to access the clutch and flywheel. The longitudinal engine position makes it also easier to work on the engine because of the access to both engine sides. The better space can also be used for a twin A-arm solution which is the superior solution in terms of friction and moving suspension weight.